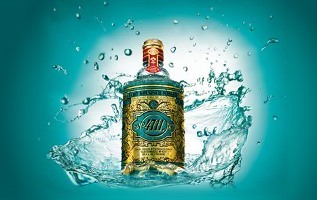 In one version of the story, the recipe for 4711 was developed in 1792 by a Carthusian monk and then given to merchant Wilhelm Mülhens of Cologne as a wedding present. In another version, Mülhens essentially piggybacked on the already popular Eau de Cologne from Johann Maria Farina, and was eventually forced to rename his product.1 The name 4711 came from the street address of the Mülhens facility in Cologne, Glockengasse 4711. Either way, the Mülhens family continued to produce their recipe into the 1990s, when the firm was purchased by Wella; Wella later became part of Procter & Gamble. In 2006, Procter & Gamble sold the 4711 business to Mäurer & Wirtz. Recent releases include 4711 Ice Cool, 4711 Acqua Colonia collection (2009), Acqua Colonia Blood Orange & Basil and Rhubarb & Clary Sage (2010), Juniper Berry & Marjoram (2011), 4711 Nouveau Cologne (2011), Mandarine & Cardamom (2012), Pink Pepper & Grapefruit (2013), 4711 Wunderwasser (2014), Plum & Honey and Hazel & Tonka (2014), 4711 Wunderwasser Elixir & Wunderwasser Intense (2014), Lime & Nutmeg (2015), Red Apple & Chili (2016), White Peach & Coriander (2017), Green Tea & Bergamot, Coffee Bean & Vetyver (2017), Remix Cologne (2017), Blackberry & Cocoa, Vanilla & Chestnut, Saffron & Iris and Myrrh & Kumquat (2018). See all articles on Now Smell This tagged 4711. 1. In 2009, newly-discovered documentary evidence established that Gian Paolo Feminis was the "inventor" of the Aqua Mirablis (it was meant to be worn or ingested as a tonic) recipe used by Farina for his Eau de Cologne.